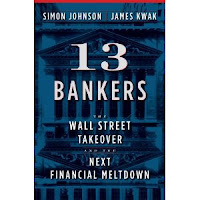 The new book "13 Bankers" by Simon Johnson and James Kwak was interesting. Not great, but sill interesting. 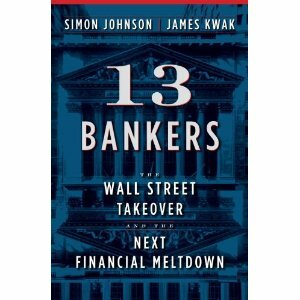 While I wasn't a fan of the detailed history back to the days of Hamilton and Jackson, the book did offer some new insights into the banking landscape here in the USA. In particular, it highlights the self-perpetuating banking oligarchy that reigns here. The book's take-away message: the authors propose that we get rid of financial institutions that are "too big to fail" and they propose a reasonable approach to doing that, while addressing the many arguments against it. Johnson and Kwak run an economics blog named The Baseline Scenario that provides commentary on current events.